Tripp Lite's 0.91 m (3-ft.) SVGA/VGA Right Angle monitor replacement cable is the gold standard in video cables. One end features a super-slim right angle connection for tight spaces, i.e., behind a PC. The mini-coax (RGB) and paired video wire construction delivers superior signal quality. Gold plated connectors and gold plated copper contacts ensure excellent conductivity. Double shielding (foil and braid) provides maximum EMI/RFI protection. Both high density DB15 male connectors are molded and have integral strain relief to ensure they last a lifetime. 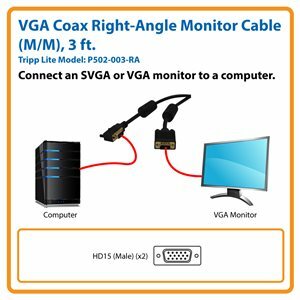 The Tripp Lite P502-003-RA VGA Coax Right-Angle Monitor Cable (M/M) is an excellent replacement for an existing cable that is lost or worn out. Compatible with PCs and Macs equipped with a female SVGA or VGA port, it supports high-definition resolutions up to 2048 x 1536 for realistic, razor-sharp video. One end features a slim right-angle plug perfect for connecting in tight spaces, such as a computer pressed against a wall. The three-foot molded cable features premium foil and braid shielding, as well as mini-coax (RGB) and paired video wire construction, to deliver top-of-the-line signal quality and protection from EMI/RFI interference. Gold-plated HD15 male connectors with gold-plated copper contacts ensure excellent conductivity. Integral strain relief ensures the cable and connectors last a long time. The P502-003-RA comes with a lifetime warranty. It’s manufactured in compliance with strict RoHS specifications, reflecting Tripp Lite’s commitment to environmental responsibility. P502-003-RA VGA Coaxial Right-Angle Monitor Cable (M/M), 3 ft.